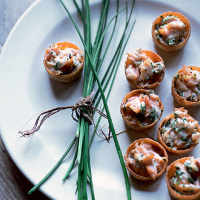 These little tartlets are a dream to assemble and eat – with the smoked fish beautifully complemented by creamy horseradish and chives. Preheat the oven to 190°C, gas mark 5. Mix the horseradish with the crème fraîche and lemon juice, then season. Flake the fish and mix together with the horseradish mixture and the chives. Spoon into the pastry cases and cook on a baking tray for about 10 minutes, until the pastry is crisp and the filling is bubbling and hot. Cool slightly on a wire rack before serving. The filling can be made ahead, but fill the cases just before cooking to avoid the pastry going soggy.